Adatto a tutte le biciclette standard per bambini e adulti. 4 raggi della bicicletta. Colore: arancio / giallo. Set 4 catarifrangenti small. Bifacciali, per raggi ruote. -Condizioni di vendita. SEZIONI INTERNE. -TUNING INTERNO. -TUNING ESTERNO. -RICAMBI & C. -PORTASCI PORTATUTTO & C.
Set 2 catarifrangenti grandangolari. -Condizioni di vendita. SEZIONI INTERNE. 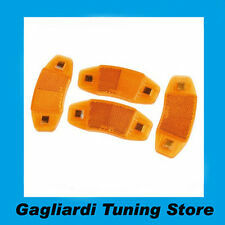 -TUNING INTERNO. -TUNING ESTERNO. -RICAMBI & C. -PORTASCI PORTATUTTO & C. -PORTACHIAVI MOMO DESIGN. Set 4 catarifrangenti. Bifacciali, per raggi ruote. -Condizioni di vendita. SEZIONI INTERNE. -TUNING INTERNO. -TUNING ESTERNO. -RICAMBI & C. -PORTASCI PORTATUTTO & C.
Ideali per le escursioni notturne in totale sicurezza. BIKE PROFESSIONAL. Codice oggetto. Bifacciali, per raggi ruote. Set 4 Pz.catarif.raggi Omol. Bifacciali, per raggi ruote. Set 4 Pz.catarif.raggi. Splendidi catarifrangenti per ruote. Perfetti per avere una maggiore sicurezza a bordo della propria bicicletta. possesso per superare l'empasse. Il reso è applicabile ai soli prodotti non utilizzati (in caso di componenti questi non devono essere stati installati). Flash 30 tipi di pattern di fiori, fissare sui raggi della bicicletta con due bulloni rotanti. 1 parte luce della ruota del LED 14. - 14 LED colorati, a due lati. - Quantità di LED: 14. - Design a prova d'acqua, può essere utilizzato in pioggia. Flash 30 tipi di pattern di fiori, fissare sui raggi della bicicletta con due bulloni rotanti. 1 parte luce della ruota del LED 14. - 14 LED colorati, a due lati. - Quantità di LED: 14. 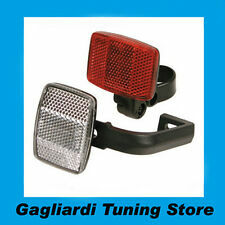 - Tempo di lavoro: circa 5 ore.
1 Rear Mudguard Oval Warnning Reflector. TRIXES Bike Bicycle Wheel Spoke Reflectors x 12. Car & Motorbike Gear. 12 x Wheel Spoke Reflectors. Brighten up your bike with this cheap and effective way to easily be seen when riding at night. 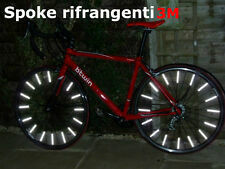 Each reflector simply fits onto the spokes of your bike wheels to give 360 degree reflective visibility. 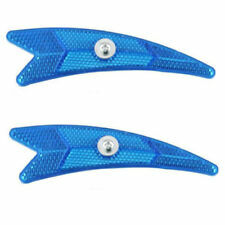 2pcs(1pair) Bike Spoke Reflector. Fit to any spoke, Easy to install. High reflective, more safety cycling at night（The product itself does not shine,it is reflected by other light ）. 24x Pairs White Wheel Bike Reflectors. Taken from brand new bikes. Includes free postage. 20 Reflective safety stars 4cm White. will be supplied 20 stars 4cm each with application tape for easy application. the colour when not reflecting is a silver colour once light hits it at the correct angle it goes a bright white as in the picture. 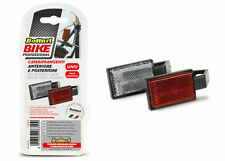 Bike reflectors front and rear. easy loop and clip attachment. Came with new bike & and are unused Dispatched with Royal Mail 2nd Class. 15x Front White Bicycle Bike Reflectors Job Lot. Taken from brand new bikes. Includes free delivery. (D)FREE A SECOND PAIR OF THE WHEEL REFLECTORS ABOVE SO YOU CAN FIT TWO REFLECTORS IN EACH WHEEL FOR EXTRA SAFETY. 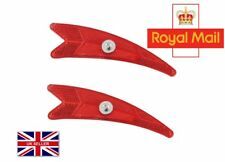 THESE ARE ALL HIGH QUALITY REFLECTORS THAT CONFIRM TO THE HIGH BRITISH STANDARD FOR BIKE REFLECTORS. BRAND NEW BUT NOT IN PACK.........A RECTANGULAR BICYCLE/MOTORING REFLECTOR GENERAL PURPOSE, COULD BE USED IN MANY APPLICATIONS SMALL....3 CM X 9CM DIAMETER, MADE OF PLASTIC THE PHOTO ABOVE WAS TAKEN WITH FLASH, SO IT IS SHOWN "ILLUMINATED". WITHOUT FLASH IT IS MUCH DULLER PEEL OFF SELF ADHESIVE... BUT I STONGLY SUGGEST THAT YOU GLUE ON IN SOME APPLICATIONS, THIS IS COMMON SENSE... THE ADHESIVE PAD ON THE BACK MAY NOT BE CENTRALLY AFFIXED SENT LOOSE IN A JIFFY BAG RED PLASTIC. BRAND NEW BUT NOT IN PACK.........2 RECTANGULAR BICYCLE/MOTORING REFLECTOR'S 2 FOR EACH BUY IT NOW GENERAL PURPOSE, COULD BE USED IN MANY APPLICATIONS SMALL....3 CM X 9CM DIAMETER, MADE OF PLASTIC THE PHOTO ABOVE WAS TAKEN WITH FLASH, SO IT IS SHOWN "ILLUMINATED". WITHOUT FLASH IT IS MUCH DULLER PEEL OFF SELF ADHESIVE... BUT I STONGLY SUGGEST THAT YOU GLUE ON IN SOME APPLICATIONS, THIS IS COMMON SENSE... THE ADHESIVE PAD ON THE BACK MAY NOT BE CENTRALLY AFFIXED SENT LOOSE IN A JIFFY BAG RED PLASTIC. Alpha Light Reflector Rear 3 LED Pannier Carrier Fit - XH48. •Carrier Fit - Built-in Reflector. •3 Super Bright LED. 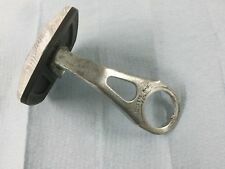 (A) FRONT REFLECTOR WITH FORK MOUNT BRACKET TO SUIT A CANTILEVER OR CALLIPER BRAKE BIKE. THIS IS A MUST HAVE ON YOUR CYCLE FOR WINTER SAFETY. FULL SET OF REFLECTORS TO THE HIGH BRITISH STANDARD BS6102/2. 2 pieces light reflective, slap to wrap wrist and ankle strap with steel piece in it. Light reflective strap set. I hope everything is going well. We promise we will give you a professional, effective, quality and a hassle free service. 4 Reflective safety star discs White. the colour when not reflecting is a silver colour once light hits it at the correct angle it goes a bright white. make sure the surface you are applying this decal / sticker to is clean and free of wax and grease (this can cause the sticker not to stick or peel). (This is a must have on your cycle for winter safety. 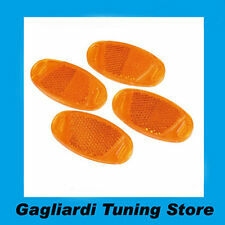 Full set of reflectors to the high british standard BS6102/2. 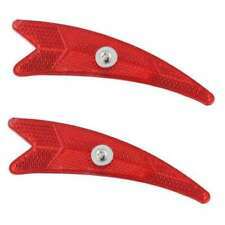 c) A pair of wheel reflectors that suit any bikes with spoke wheels from 16" to 29" wheels.